When I was a kid, I had a special appreciation for media that didn’t talk down to me and tried to tell a good story with interesting lore and backstory. Knuckles the Echidna, a 32 issue monthly comic series from Archie Comics, did just that. Given Knuckles’ 25th anniversary, I thought it would be nice to revisit the comics in some way. I haven’t read them in some time (due in large part to their lack of easy digital availability) so I will be recounting my memories of the comic’s tone and themes somewhat vaguely and broadly. Hopefully, I will be able to do a deep dive into the comics in the future. I had been reading Archie’s Sonic comics for a couple of years when the Knuckles the Echidna series got going. Knuckles was a character that got my attention before I was even exposed to his first game thanks to his cool design, his weird abilities, and most importantly his place in the story. Knuckles was that cool guest star character who only popped up occasionally, making his appearances feel special. He could not only could go toe to toe with Sonic himself, but often would, making him Sonic’s “rival,” at a time when that concept was still fresh to my young mind. To me, Knuckles was the coolest Sonic character. I must’ve not been the only kid who thought that because Knuckles became pretty popular in the comics. His occasional appearances turned into regular back story appearances, which lead to a mini series, which finally led to a monthly ongoing…which was weird as all heck, but also very neat. As I said before, the Knuckles series didn’t talk down to kids and tackled some subjects that most kids media didn’t put much focus on back then. The world had politics, including three distinct factions: the fanatical technophilic Dark Legion, the fascistic (and later racial minority) dingoes, and of course the citizens of Echidnapolis (who were predominantly echidnas, of course). The series even featured an entire arc devoted to the world’s politics and the tension building up between the factions. The comic also wasn’t afraid to deal with death and romance, going so far as to devote an entire three-issue story arc to Knuckles and Julie-Su’s budding love-life. The comic also had a lot of backstory and lore. 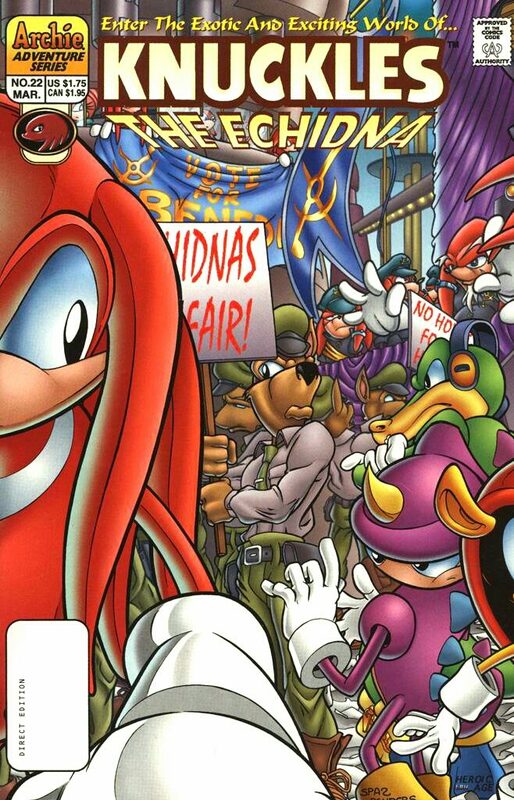 The tension between the Dark Legion and the citizens of Echidnapolis went back hundreds of years, to events involving Knuckles’ ancestors feuding over how technology should be used in echidna society. 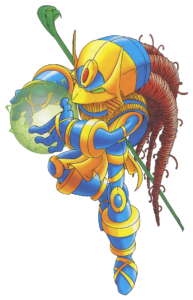 Before that, there was Enerjak, a power-mad entity created when one of Knuckles’ ancestors absorbed eleven of the island’s twelve chaos emeralds (yes, twelve) in an attempt to return Angel Island (called simply the Floating Island in the comics) to the planet. The series would often dive into this history to give the current day plot line a greater, more epic context, since the conflicts the comic covered often had roots going back centuries. The comic also had loads of weird, often sci-fi concepts. The Dark Legion, who served as the comic’s primary villain faction, often sported loads of cybernetics to display their devotion to technology. These cybernetics could look kind of gruesome to me as a kid. 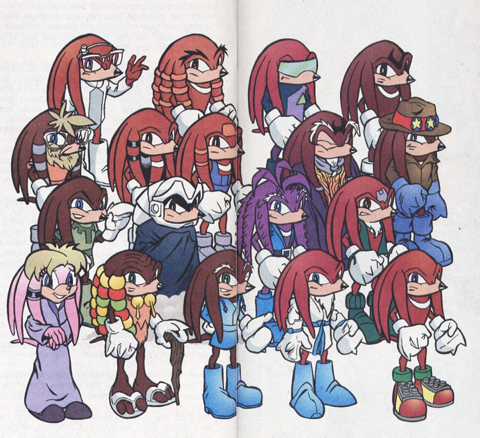 Then there was the Brotherhood, a clandestine organization made up of Knuckles’ living ancestors, who as it turns out were inexplicably long lived, with the oldest being hundreds of years old at the start of the series (I’m not sure an explanation was ever given for that). The comic opened with the Dark Legion escaping from an alternate dimension known as the Twilight Zone, while the second arc focused on two dimensions holding the separate cities belonging to the echidnas and dingoes collapsing in on each other. Then there was Knuckles himself, who was genetically modified when his father, Locke, irradiated his egg with chaos energy to give him special powers. So yeah, the comic was cool…and weird. Putting my childhood nostalgia aside, it was also flawed. The writing could feel stiff, and many characters often sounded like they were speaking with the same voice. The comic didn’t always make use of what should have been interesting plot revelations, such as when one member of the Brotherhood turned out to be a former leader of the Dark Legion. This reveal did not have the emotional pay off one would expect: his son, who held a special hatred for the Legion, turned on him immediately, while the rest of the Brotherhood did not seem to express much emotional grief over their son/grandfather/great-grandfather/etc turning out to be a villain the whole time. We were also denied the satisfaction of a reunion between the Brotherhood and the man the Legionnaire replaced. As I said before, its been a long time since I last read these comics. I don’t remember how pervasive the issues I mentioned above were, but they are there. As much as I enjoyed them as a kid, I couldn’t help but feel a bit…underwhelmed upon revisiting them. That said, there’s still plenty about the comic that did age well. The interior art was mostly done by Manny Galan, one of the best artists Sonic comics have ever seen. He nails the look of a the comic’s characters and world perfectly, and his work is still a joy to look at. The comic also employed an interesting concept with its covers: each cover of the comic’s three issue story arcs could be combined together into a single image. These covers were mostly done by Sonic comic legend Patrick Spaziente, often depicting epic scenery and action. It’s kind of unfortunate these comics are so inaccessible in an age when nearly any comic can be bought online. This does, unfortunately, bring us to one of the reasons why I have difficulties going back to these books even when I do have access to my old copies: the Ken Penders lawsuit. This is something I’d rather not get into right here, so I will keep it brief: I think every artist should be compensated for reprints of their work, and I wish Archie had worked something out with Penders to make that happen. I hope IDW does what they couldn’t. I also think that, by copywriting the characters he created, Penders effectively destroyed this comic’s legacy. Its characters will never be able to grace any Sonic comic continuity again. They have already faded into complete obscurity and they will never again be able to interact with the game characters they were created to flesh out. I think this is very unfortunate. Though, in a sense, the Knuckles series being inaccessible does feel right to me. Back when the Knuckles comics were being made, I had difficulties getting ahold of them. My local book store didn’t carry them and the comic book stores that did kept going out of business. So to get them, I’d have to go to a Books-A-Million in Potomac, Virginia, which was an hourlong drive. I didn’t get to go often, but whenever I did and I got to see that Knuckles comic on the rack, it was always special. That reflects my feelings on the comic as a whole: special, memorable, and a series that will always evoke my childhood to me. I do hope inaccessibility does not become this series’ fate. So far as I’m concerned, it at least deserves more than this. It has been revealed at IDW’s Sonic Comic Town Hall panel (live-streamed by TSSZ), that Ian Flynn will be the lead writer. Fans of the later Archie Sonic comics will be pleased to see Flynn return to his role as creator of Sonic comic story lines. While details on the comic from the panel has been sparse so far, it has been announced that the new Sonic comic will be in its own continuity and will start with a new number one with “brand new stories.” The comic will launch April 4th, 2018 with the first four issues released on a weekly basis, continuing on monthly. While Flynn’s involvement as lead writer has been confirmed, no other names have been mentioned at the time of this writing. UPDATE: IDW has released a high quality version of the Tysone Hesse teaser image alongside their press release. It’s been a month since the announcement that the Archie comics will no longer produce it’s long-running Sonic the Comic, and that a new partnership with IDW will continue to keep Sonic alive in print. Information on the new incarnation of the comic is set to be divulged at New York Comic Con in October. Before we look to the future of Sonic the Comic, why don’t we take a look at the past? In this feature I would like to talk about the many aspects of the American comics, starting with my own 24-year experience with the comic strip adventures. 290 regular issues of the main comic. Several crossovers with other franchises. Dozens of beloved characters, stories and places that will always stick with the fans. We are sure many fans, including ourselves are sad to see this chapter of Hedgehog history come to an end. We will keep on top of any future updates on what SEGA does in the comic industry next. And with the final panel ever printed in Archie Sonic, that’s this case closed too. Perhaps this mystery will finally be solved. It’s rare a story twists so soon, but here we are with an important update. Earlier today, I gave a general comic update on what had gone on in the last month regarding the Archie Sonic comics. As said there, Sonic #291 and Sonic #294 were listed as cancelled by the publisher on PreviewsWorld’s order form. Another monthly update of the Archie comic situation, and things have cycled around once again, with similar updates to last month. First up, Sonic is absent from the July 2017 solicits, marking three months in a row as a no show. With Sonic Universe #95 not released for its slated April 12th release, and Sonic #291 not listed for release next week despite its previous given date of April 26th, we won’t be seeing any Sonic comics in April, and makes any May releases unlikely. Last month, we brought you an update on what was going on with the Archie Sonic Comic as of February, concerning delays on PreviewsWorld and Sonic being absent from the May solicitations for Archie. There’s been more interesting developments since then, so here’s a roundup of information as of March. Fans of Archie’s Sonic comic series will be waiting awhile longer to get their next Sonic comic fix. According to the website Previewsworld, which posts solicitations for upcoming comic books, the next issues of both Sonic the Hedgehog and Sonic Universe have been delayed again to April and beyond. Sonic the Hedgehog #291, originally scheduled for late January before being delayed to March 1, then March 22, is now arriving in stores April 26. Sonic Universe #95 will be shipping on April 12, three whole months after the last issue. Of course, these delays have also affected subsequent issues, with Sonic #292 shipping on May 24 and Sonic Universe #96 shipping on May 10. The solicitations for the remaining issues have yet to be altered, but they will no doubt be changed eventually to reflect these delays. Today, it seems even these dates may not be set in stone; while in the past Archie has re-solicited delayed comics, their recently released May solicits did not feature any Sonic comics, new or old. Things have been rocky for Archie’s Sonic comics these last few months. In addition to these delays, subscriptions for the comics became (and remain) unavailable, which we first reported back in January. The exact cause of all this remains unclear, as Archie staff have remained mum throughout all of this. Wait, what? Read on and prepare…to get even more confused. Yes, after what happened last week, Archie have actually released new solicits for April. We’ll cover the solicits themselves first, then provide an update on the whole situation after. After over 24 years in a near-continuous run, it appears there are some very strong signals that Archie’s Sonic the Comic is set to be cancelled in the near future. Following phone calls from multiple parties, including members of our own SSMB to Archie’s subscription office, we have learned that they are not taking any more subscriptions pending more information. It’s almost time to weigh anchor in the arc finale this week! 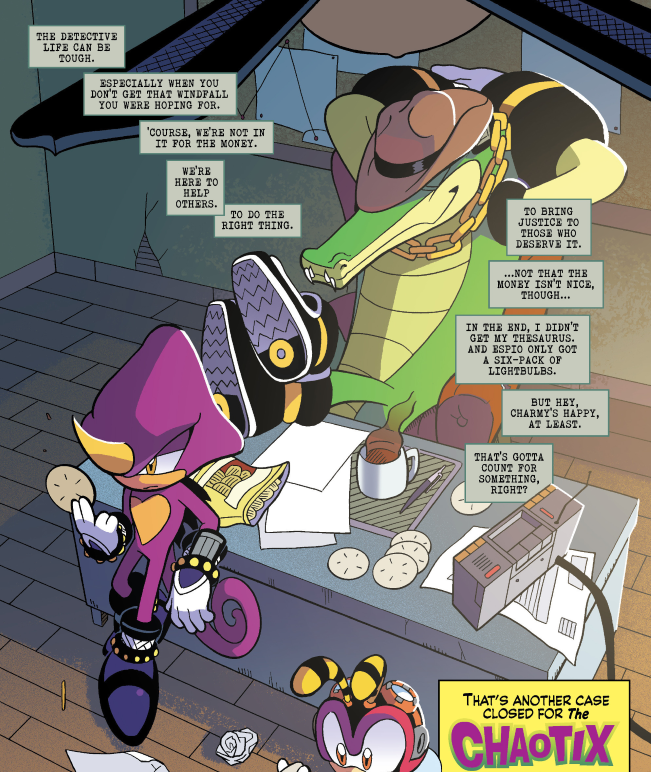 The preview for Sonic Universe #94 has been released, and things just keep getting deeper for the Chaotix! They’ve managed to get themselves into the heart of an ancient temple with their pirate captors and the hostage. This temple warns of an fearsome power being inside…and Captain Shellbreaker is on the verge of finding it! It’s time to look into the cosmic eternity in this week’s issue of Sonic the Hedgehog! The preview for Sonic the Hedgehog #290 has been released, and it’s Sonic CD’s turn for some time in the spotlight! When Sonic attends the annual arrival of Little Planet, things don’t go as planned when it shows up robotic and chained to the planet. Comic Previews: Sonic the Hedgehog #293, Sonic Universe #96, Sonic Mega Drive: Overdrive #1 and More! March is looking to bring a whole plethora of new Sonic content! The solicitations for March have been revealed, and there’s a slew of stuff to get through! First up, in Sonic the Hedgehog #293, Sonic is with Honey on the set of a strange parody of Sonic’s antics, ‘Sonic Man Heroes’. Continue reading Comic Previews: Sonic the Hedgehog #293, Sonic Universe #96, Sonic Mega Drive: Overdrive #1 and More! Have never been at all historic. To have the time to stop and sing. There’s suspicion and scheming on the seven seas in the last Universe issue of the year! The preview for Sonic Universe #93 has been released, and the Chaotix are still trying to find a way out of the mess they’ve managed to get themselves into! As they’re still scoping the ship and crew for opportunities to escape, there’s more to explore of the captors’ pasts, and loyalties are brought to breaking point. Continue the trip down memory lane as the comic looks back at the best-selling Sonic game of all time! The preview for Sonic the Hedgehog #289 has been released, and the 25th anniversary celebration has moved forward a game in its adaptation of the classic quartet! After fighting against Dr Eggman’s menacing contraptions on the ground, Sonic and Tails have now gone into the sky to take the fight to the mad doctor himself in his Wing Fortress! We’re going back to the past for the newest comic arc! The preview for Sonic the Hedgehog #288 has been released, and it continues the 25th anniversary throwback of Mega Drive and the Next Level with the start of a four-month classic-based arc! Relive the very origins of the franchise when this month’s issue takes a look back at the events of Sonic 1, with a little comic flavour sprinkled on. Two at the same time? Your eyes are not being deceived! As it turns out, The Next Level was not the only comic Archie covered in their newest press release; the final installment of Sonic Mega Drive’s story has been announced as Sonic Mega Drive: Overdrive! The trip down memory lane continues with the follow-up to Archie’s hit seller set in the classic era! An early preview of Sonic Mega Drive: The Next Level has been released, and it’s an extra-large continuation of what was started in Sonic Mega Drive! Sonic, Tails, Knuckles and Amy are now one team and still looking for the Ancient Gears to stop Eggman’s weapon in its tracks, but things go awry when Sonic decides to splinter off to do things his own way. They’re detectives you want on your side, and they’ll show you why in the upcoming arc they have! The preview for Sonic Universe #91 has been released, and the Chaotix have a new job to deal with! The Chaotix are approached by a Meropis guard as their princess has been held to ransom (from what it seems, anyway) and they need their expertise to find her again. We start off the year by ending our look to the past and wrapping up the sea-faring case! The initial solicits have been released for January’s comics, and there’s thrills to be had as both of the running arcs reach their climax! First up, in Sonic the Hedgehog #291, Sonic and Tails have spent the entire adventure running around Angel Island and becoming victim to Knuckles’ nefarious traps. The “Shattered World Crisis” arc came to an end with Sonic the Hedgehog #287, three years after the “Worlds Collide” crossover between Archie’s Sonic the Hedgehog and Mega Man series. While the stage is set for new arcs with an earnest Sonic Lost World adaptation in the works and Team Chaotix taking to the seas with the upcoming Sonic Universe saga next week, the main series will now be taking a step back in time with “Genesis of a Hero,” setting the stage for the Blue Blur’s humble beginnings within the new continuity. Issue #288—”Genesis of a Hero” Part One—arrives in comic book stores three weeks from now on November 9th, and a preview of the issue’s art has been provided courtesy of Comics Alliance! Check out the gallery and the official solicitation below. It all comes together as the finale of the Shattered World Crisis is upon us! The preview for Sonic the Hedgehog #287 has been released, and it’s make or break time for our heroes! Sonic has managed to turn super and, with the help of Chip in the Gaia Colossus, is taking Dark Gaia on for the fate of the world! 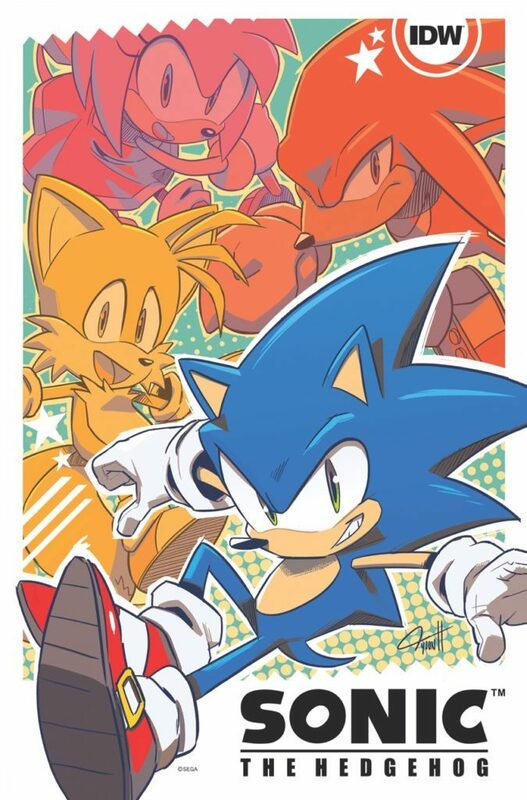 There were a lot of ways to celebrate Sonic’s 25 years, and fans of the classics have certainly had their attention caught by Archie Comics when the Sonic: Mega Drive #1 special was released during the summer. The commemorative comic depicted Genesis-era Sonic and friends in a brand new adventure as Eggman seeks relics known as the Ancient Gears to power his MEGADRIVE doomsday device. The sequel issue—The Next Level #1—is expected to release in November, but you can enjoy a taste of its awesome artwork early thanks to an exclusive preview from Comic Book Resources. Check out the gallery below for some Tyson Hesse and Matt Herms goodness! Everything will become crystal clear in the finale for the fate of Angel Island! The preview for Sonic Universe #90 is now available, and you’ll certainly feel this one! Walter Naugus has managed to restore the Master Emerald, get his powers back and leave the heroes in crystal. Worse than that, Angel Island is now beginning to fall, and Knuckles and Amy have mere hours to put it right before the restoration of the planet finishes it off for good! Hoist the anchor, raise the sails and…get up the chain? December will have you do just that! The solicitations and covers have been revealed for this December, and adventure awaits once again! Firstly, in Sonic the Hedgehog #290, we’re looking back at Sonic CD and its time travel shenanigans. Eggman’s really pulling out all the stops in the penultimate issue of the Shattered World Crisis arc! Sonic the Hedgehog #286 has had its preview released, and it’s cranking up to a world-shattering finale! Eggman seems to have all the aces right now; he has hold of Chip and is using him to control the Gaia Colossus, the Egg Dragoon is out to play, Eggmanland is working as it should and the Death Egg is still in town. We certainly have a rare occasion today; there are two different Sonic books coming out on the same day, and the previews for both have been released! First up, Knuckles, Amy and team Dark have finally reunited. But that may not be a good thing; Omega is under Walter Naugus’ control and aiming to wipe out the others! Comic Previews: Sonic the Hedgehog #289, Sonic Universe #92 and More! Whether you’re into ships of the sky or ships of the sea, November has you covered! The solicitations and covers for November have been revealed, and this is quite the world tour! First up, we join Sonic and Tails as they take to the skies after saving Westside Island, but Eggman’s got his most lethal attacks up there! Continue reading Comic Previews: Sonic the Hedgehog #289, Sonic Universe #92 and More!